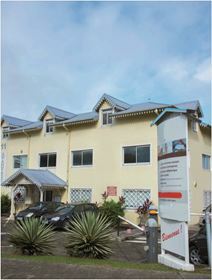 Office Space - Fort de France, Fort de France County. Only five minutes from the town center and from the regionally significant local airport, this professional and contemporary business center provides a choice of up to 10 fully fitted, purpose-suited and technologically equipped office suites and diverse workspace solution packages ranging from 11m² to 15m². As well as meeting room facilities and a beautiful reception area there is also an on-site cafeteria.